I’ve said this before and I’ll say it again: I love it when a book can teach me something new. Like many, I read The Velveteen Rabbit as a kid (full disclosure: the idea of burning all of the boy’s toys and books still leaves me with scars), but I never knew anything about the author, and I certainly knew nothing of her family. 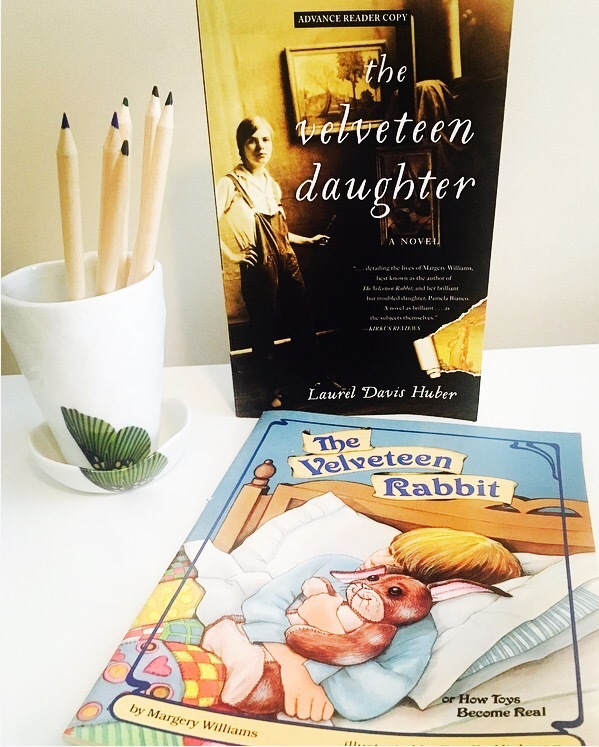 Thanks to Laurel Davis Huber’s debut novel, The Velveteen Daughter, this untold story has been brought to light in a read that is compelling, poignant, and downright fascinating. The Velveteen Daughter highlights the relationship between children’s author Margery Williams and her daughter, talented artist Pamela Bianco. A child prodigy praised by Picasso at the age of four, Pamela’s life is wrought with severe depression, unrequited love, and the effects of facing fame at far too young an age. Through her struggles and her successes, her mother—balancing her writing career and her family—remains her guiding strength and greatest ally. Spanning seven decades and two continents, and featuring the famous names of Eugene O’Neill, Richard Hughes, and Gertrude Vanderbilt Whitney, The Velveteen Daughter is in essence a story about the bond between mother and daughter. Meticulously researched, it immerses the reader into the private and professional lives of these remarkable women whose names should not be forgotten by history. From the earliest pages it became clear to me that Laurel Davis Huber put extensive care and examination into Pamela and Margery’s story, using letters and other primary source material to bring their tale so beautifully to life. Through alternating narratives, each woman is given her own unique, sympathetic voice—a mother who, with heart-wrenching agony, wants her daughter to be happy; a daughter trapped by illness, seeking something that will make her feel real. While the novel dives into Pamela’s need for her father’s approval, her one-sided infatuation with Richard Hughes, and her spontaneous marriage, the unconditional love between Pamela and Margery is at the heart of every chapter. I went into this novel knowing nothing about either woman, and came away from it so glad that I got to spend time with their story. The beauty of historical fiction is that it can re-introduce the world to long-gone figures, and that’s exactly what The Velveteen Daughter does best. I commend Laurel Davis Huber for giving the Bianco women their turn in the spotlight, and I encourage anyone interesting in learning more about them to pick up this treasure of a book. For more on Laurel Davis Huber and her debut novel, visit laureldavishuber.com. Papa, Let’s Preach! It’s Hemingway Week! You’re so very welcome!! Congratulations on a wonderful novel!